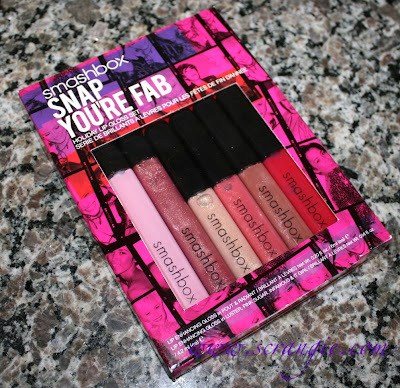 The Snap, You're Fab Lip Gloss Set is this year's Smashbox Holiday gloss set. They do a mini gloss set every year and that's one of the main things I look forward to from them. It's a little different this year as there's no special scents or different colored tubes like there have been in the past, but it's still a decent set. Take a look. 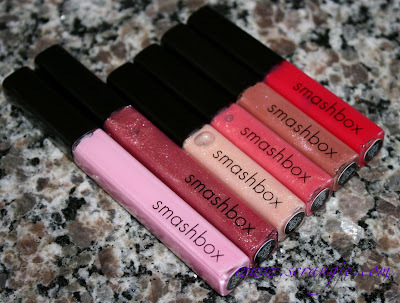 The Smashbox Snap, You're Fab Holiday 2011 set comes with two full-size glosses and four generously sized minis. The shades are Pout (full size), Radiant (full size), Luster (mini), Pink Sugar (mini), Infamous (mini) and It Girl (mini). They each have the standard fuzzy doe-foot lip gloss applicator. 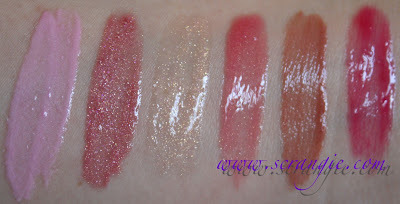 Swatched with flash and without: Pout, Radiant, Luster, Pink Sugar, Infamous, It Girl. 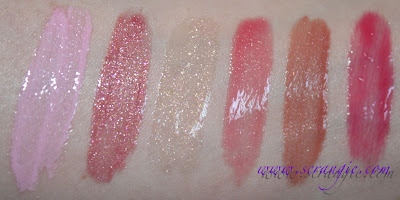 One thing to note: Radiant is similar to Rose Quartz, the gloss I loved from the Glambox 9 set with the rainbow sparkles. 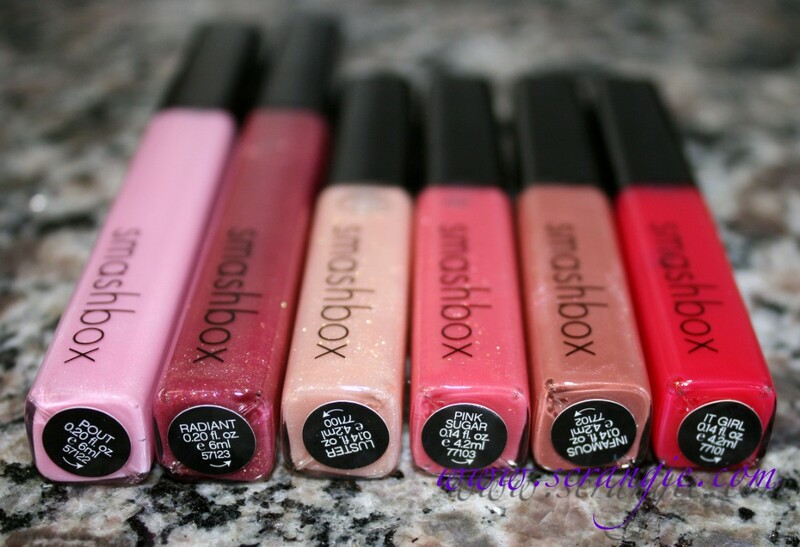 Smashbox glosses have a smooth, non-sticky texture. While the colors can be more sheer than other, stickier textured glosses, the comfortable wear of these is a good trade-off. These are also borderline unscented. I smell a really faint cinnamon-like scent, but I'm not sure if it's fragrance or just the base smell of the gloss. It's not strong, you can't taste it, and it's not listed as being scented in the description of the set. 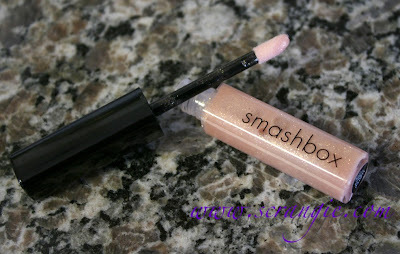 Smashbox glosses usually smell faintly like vanilla or cinnamon to me, depending on the shade. Not all shades smell the same for some reason. Set includes two full size glosses. It's only $24 which is a really good value considering you get two full sized, good quality glosses among the minis. The formula is silky smooth, feels nice to wear and doesn't stick your lips together or leave weird tacky residue. The colors this year aren't as interesting as in previous years. My favorite was the Rapture collection set from 2008, but the Wish collections from 2009 and 2010 were pretty good too. The name is really stupid. I felt embarrassed typing it. I get it, it's Smashbox studios, photography, camera, 'snap' a picture, it goes with the theme... but... ugh... Snap, You're Fab? Come on, guys. They're not scented enough. I always prefer scented glosses. Pout is really hard to wear. It's milky, super light pink and it looks like streaky chalky disaster on me. They don't wear very long due to the smooth, non-sticky texture. Overall, though, good set, good value, good colors for the most part. One of the better values I've seen this year because for $6 more than one single Smashbox Lip Enhancing gloss, you get six, two of which are full size. Previous sets were more interesting, but there's nothing wrong with this set. It's a great way to try Smashbox glosses without spending a lot. My favorites in the set are Luster and Pink Sugar, but the only one I don't like is Pout because it doesn't work on my skintone. The Smashbox Snap You're Fab set is limited edition and retails for $24 at Sephora. I would love to see these on the lip, it's so hard to tell how a lip gloss will actually look when it's swatched on an arm. Luster looks really pretty though! I haven't bought any Smashbox products for a long time. I love their lip glosses. Not sticky. I do have plenty of glosses so I'm skipping these. They are lovely! I love all the colours, except probably Infamous because browns tend to look horrible on me. I like Luster and Pink Sugar. Thanks for sharing! I LOVE Smashbox lipglosses - my fave! They are about the only ones I can find that aren't sticky and still have great color. 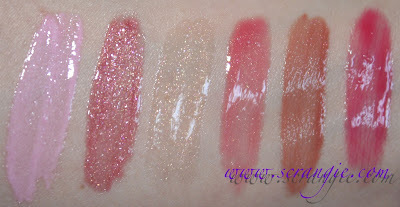 Yes, a lot of them are sheer, but that's usually what I prefer in a gloss - too pigmented and it just looks weird and gloopy on me! Hahahaha, I agree with you - the name is incredibly cheesy! I actually think the name cheapens their product. How unfortunate.